The German anti-tank “bazooka” is on the soldier’s right-side (our left vision). Where is the 3.5 rocket Launcher that took-over for the 2.36incher in the Korean conflict. While enduring the pleasures of infantry training at Fort Ord (1961) I had the pleasure of launching a couple of rockets through the 3.5 and I was amazed at its accuracy, hitting the derelict tank right where I aimed.. The later model M20 3.5″ ( 90mm ) bazooka fielded by the U.S. Army was both a response to the increasing thicknesses and resistance to penetration of sloped armor, and also to the realization that the Panzerschreck far outperformed the 2.36″ bazooka in every respect. The proper name for the Panzerschreck was Raketenpanzerbusche 54, sometimes abbreviated to RPzB 54. It fired an 88mm rocket equipped with a HEAT warhead out to an effective range of 150m ( 495 ft. ) at a velocity of 110 m/sec. ( 360 ft./sec. ). Armor penetration was over 200mm and it was capable of defeating all Allied tanks, including the Soviet IS-2 ( JS-2 ) Stalin heavy tank. The major downside to the RPzB 54 was its length ( 164 cm / 5.38 ft. ) and weight ( 11 kg / 24 lbs. empty ), which made it more difficult to conceal and carry on the battlefield. The hot exhaust trail of the 3.3 kg ( 7.3 lb. ) rocket as it left the tube also necessitated installation of a blast shield for the firer, which added to these problems. Like the bazooka, the weapon could not be fired from enclosed spaces such as bunkers without risking injury because of the back blast from the tube upon launching. An improved model, the RZpB 54/1, was introduced later in the war. It had a shorter barrel and improved rocket with an effective range of 180m ( 594 ft. ). The large battlefield signature of the Panzerschreck ( large back blast accompanied by a lot of smoke ) additionally meant that the firing team had to constantly and very quickly shift positions to avoid enemy counter-fire. This is an excellent insight into the issue of subject weapon! One must wonder what kind of horror must have been in minds of tank crews knowing that the other side has this. This must have been a serious threat to any tank on battlefield. As was done in past in case of Japanese antitank rifle and similar designs, this topic hugely enriches already voluminous menu on FW. I am glad to see that happening. The German Army was also fielding test trials for an even bigger version of the Panzerschreck (by the way, for those who don’t speak German it translates literally to Tank Terror)somewhere in the winter of ’44/45. I think it was called the Hammer. Thanks for the link, Boris. The forum.axishistory.com web site always has really interesting and informative forums and technical as well as historical discussions. I have read quite a lot of their postings and have always been impressed with the overall depth and scope of knowledge. “He was sent to Hawaii, but was recalled in 1940 and put to work on a “Special Project”, namely, to see if his rockets could be of any use as weapons. With no funds and no support he worked with a staff of one and in less than a year he had produced and tested a simple shoulder-fired rocket, launched from a tube and stabillised by folding fins. All it lacked was a warhead. This came in a dramatic way. In 1940 the Swiss designer of the shaped-charge device which had so signally failed to impress the British attache (MG: the British had figured out for themselves how the shaped charge worked, and so had sent the Swiss packing without paying them a penny) arrived in the USA with his secret still intact – as far as the USA was concerned. He managed to sell his idea to the Americans, which must have satisfied him and he forthwith returned to Switzerland. The US promptly put a crash program into effect to equip the army with hollow-charge grenades. The design chosen was the Grenade, High-Explosive, Anti-Tank M-10, which was excellent in every way except for its weight. It was too heavy to be projected from the muzzle if a rifle or even a 0.50in machine-gun – an idea tried in desperation – and the Ordnance Corps found itself the unhappy owner of a rapidly growing pile of M-10 grenades which nobody wanted to shoot. An experimental grenade-launcher proved to be too big and still with too much recoil. Another idea which only received scant attention was to add a small rocket to the base of the grenade and launch the whole thing from the muzzle of the Springfield rifle, using the long bayonet as a launch rail. The idea takes a lot of beating for ingenuity, but none for common sense since the rocket fired its jet straight back into the face of the firer. 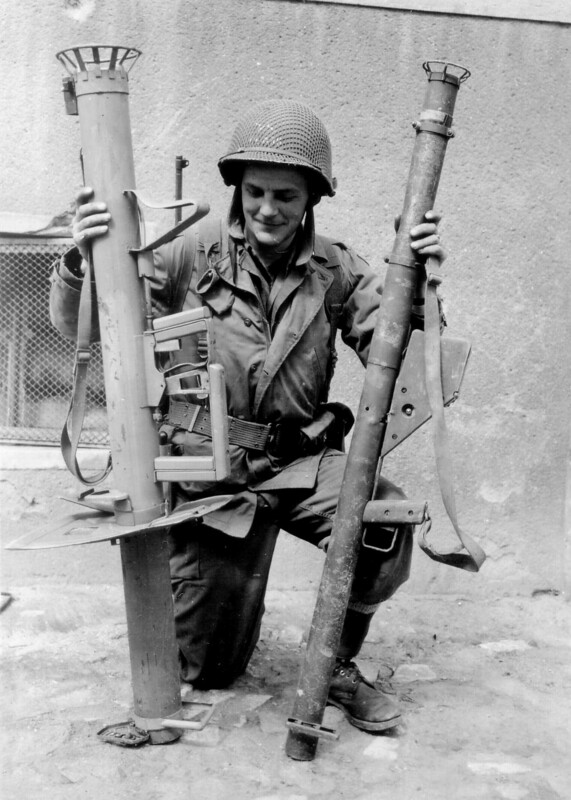 I think the one in the pic in the following link is the launcher used that day (above the Panzerschreck): http://www.williammaloney.com/Aviation/WestPointMilitaryMuseum/GrenadesAntiTankWeapons/pages/03BazookaPanzerschreck.htm The buttstock and grips are remarkably Thompson-like in appearance. This is particularly nice set of pictures. Thanks! MG, this is very insightful and interesting information — thanks for sharing! We should never forget that the human story behind a weapons system is every bit as important as the technical development of that system itself ( if not more so ), for without the people and their interactions behind the programme, said system might never come to be. Awesome story! Thank you so much! Otto Morawietz, formerly curator of the Heereswaffenamt small arms collection, once told me that the first bazooka was captured on Sicily. He, together with an superior, made the trip from Berlin to Sicily to pick it up. what was Otto’s opinion on the weapon ? Sorry, as far as I remember he had no decided opinion on it. Just out of curiosity what did the Soviets use beyond Lend-Lease Bazookas? The Brits had the PIAT and the Germans had the Panzershreck and Panzerfaust as discussed. In the 40s it was a rocket launcher or a rifle grenade to deal with tanks or hard targets. The Germans had improved the US 2.7 rocket launcher and made it an “88” a number that was much feared. I have never shot a “bazooka” but I have been told they were accurate and could knock out a tank. The modern LAW is the evolution of the Bazooka and it is a very handy weapon. Some European armies followed with recoilless rifles (Carl Gustov 90mm) or rifle grenades (France) neither are popular. America’s new anti tank shoulder fired rocket is an awsome beast that punishes both the target and the operator. Maybe Russia had the right idea by evolving the Panzerfaust into the RPG series. The RPG is very easy to use; very cheap to make and feared by those on the wrong end. Also RPGs are unbelievably loud when the warhead detonates.. The Soviet Union did the right thing, first with the RPG-2 and then the RPG-7 — relatively lightweight ; very compact ; possessed of a low battlefield signature ; extremely durable under battlefield conditions yet inexpensive and easy to manufacture, maintain and use ; accurate ; versatile ( also works very well in the hands of a trained operator as a defensive weapon against helicopters and low-flying COIN aircraft ; and highly effective against heavy armor ( even today’s MBT’s are not entirely immune from modernized, updated versions of the RPG-7 ). As for the Carl Gustav, I think you meant to say the “Carl Gustav ( or Gustaf ) 84mm recoilless rifle, which is a compact, man-portable multi-role weapon that was first developed for the infantry anti-tank role. Although it has taken the better part of three decades or more to gain more widespread acceptance, more and more armies are starting to appreciate its performance and versatility — witness its adoption by the U.S. Army in recent years. Ironically, the earliest users who realized the real value of the Carl Gustav and did not hesitate to put it into general service were relatively small armies from countries such as Sweden and Singapore ( and this was in the 1970’s! ). Reminds me of a similar parallel regarding the FN MAG 7.62mm GPMG. A great many of the smaller armed forces in Europe, Asia, Africa and Latin America had discovered how excellent the MAG was and adopted it 20-30 years before the United States did. You cannot really avoid greater take Earl, if you have something to say and this is appreciated. Regarding RPG-7, it is amazing that it still keeps its position in light of lot more advanced AT rockets (such as Kornet). One thing which strikes me on RPG in comparison with other, tube type weapons is that this is indeed direct descendant of Panzerfaust and is of super-caliber type. As far as what you mentioned about new upgraded type, is it the “tandem head”? This apparently renders lattice mesh useless. I am not sure about reactive armour’s capability to deflect it. Practice in Chechnya was to use two RPGs in team and it worked. You are absolutely right. I was referring to the tandem HEAT warhead design that is supposed to be much more effective against spaced, reactive and / or compound armor. The amazing thing about the RPG-7 is its longevity as the simple basic design and oversized warhead lend themselves so easily to modifications and upgrades ; the fact that the warhead protrudes beyond the launch tube’s muzzle is a great help since the launcher itself need not be upgraded or replaced along with an improved rocket. That was very interesting information about the use of dual RPG’s in Chechnya to achieve a similar effect against Russian AFV’s. Many thanks, as always! The US Army is notorious for being highly resistant to change; It seems to me that a large part of their motivation for replacing the M60 was due to long-term reliability issues with the design. These issues didn’t become blindingly obvious until the 1980s, and as such that is when the Army really started investigating a replacement. Although this is a diversion into a different area, bringing up the Carl Gustav 84mm RR reminded me of another little-known but devastatingly effective Swedish-made weapon — the FFV013 command-detonated directional mine. This was conceived, if I remember correctly, in the 1970’s and is essentially an overpowered, oversized ( but still highly-portable ) Claymore mine designed to destroy armored helicopters attempting insertions in a Landing Zone. The general concept for deployment is to identify a potential LZ in a given area, then set up the requisite number of FFV013’s under camouflage around the LZ with overlapping patterns of fire. The mine can be set up for individual, phased, sequential and / or simultaneous detonation by remote control or by induced action, eg., trip wire. There is also no reason why more modern sensors such as photo-electric eyes, motion sensors, vibration sensors, acoustic sensors, remote pressure pads and other devices tied into a pre-programmed computerized module cannot be utilized to turn this mine into a “smart” weapon, as has long since happened with undersea mines ( such as the CAPTOR system ) as well as various categories of aerial and land mines. The Carl Gustov RR is a great weapon but it is unpleasantly heavy. It is a bear to carry but it is hell on hardened targets and armored vehicles. Its backblast is a negative and in dusty or sandy conditions it will raise a dust cloud. In dry grass you may start a fire or toast an unwary person who wanders into the back blast. This happens with the RPG as well. I agree with you on this — I’ve used both in the past, and back blast is always an issue to be aware of with any recoilless weapon. Some types still have a lower signature relative to others. The Carl Gustav RR is certainly not as compact as the RPG-7, but one gets used to the weight with long-term use. It is more the sheer bulk of the Carl Gustav, accentuated by the large rear venturi, that often gets in the way. I watched some videos with 84mm CG yesterday. Especially interesting and satisfying to watch was the one made by Swedes in their northern training ground. They fired training, current live and smoke ammunition. I have several observations: the flame/discharge from venturi was almost negligible. Second: while the gun has some healthy mass, it does not look like a bear; also I did not see much of recoil impacting gunner. One very unusual part of practice was the fact that the loader, after loading chamber and notifying gunner by tapping shoulder, briskly walked about 10m (30ft) to the side, over and over. In comparison, the American crew does not do this: the loader sticks with the gunner thru the whole process. I wish to try it myself, given the opportunity. ive heard that the walking away is only during training shots, in training senarios you can only fire a few rounds due the health concerns of the shockwave. The loader walks away so he can take the training shots after that. One reason the Army likes the Carl Gustav is ability to carry more rounds, compared to the disposable M136 AT-4 rocket launcher. The AT-4 is fairly bulky. So is the CG, but extra rounds aren’t. On the other hand, there are versions of the AT-4 (and now, many other disposable rocket launchers) that can be fired from confined spaces. Generally, this is by placing a bag of saline water behind the rocket motor that is converted to a low velocity mist, instead of a high velocity backblast. Which still leaves us with the proverbial dilemma of six of one and half-a-dozen of the other, given the need in every standing army to standardize across the board within the existing TO & E, which doesn’t leave much room for easy, flexible interchange in the immediate inventory directly available to front-line troops between two or more similar weapons except by special arrangement. The FFV-designed AT-4 ( Saab-Bofors Dynamics is the current manufacturer ) is in many ways a natural evolutionary, one-shot disposable descendant of the basic Carl Gustav 84mm RR. The version of the AT-4 currently approved for U.S. Army service is the AT-4CS, which is the one designed specifically for firing from confined spaces. The AT-4 is another example of an excellent Swedish weapon that originated in the 1970’s but which did not gain wider acceptance for various reasons until much later. It is said the AT 4 has a very nasty shock wave at the muzzle when it is fired. They look really bulky but I am told they will destroy what they hit. When forces are deployed they will demand a weapon to meet armor or hardened targets. Hopefully it will not be a beast to carry or a rifle grenade that may be as dangerous to the firer as to the target.